Definition at line 74 of file llfloater.h. Definition at line 282 of file llfloater.h. Definition at line 286 of file llfloater.h. Definition at line 285 of file llfloater.h. Definition at line 262 of file llfloater.h. Definition at line 261 of file llfloater.h. Definition at line 78 of file llfloater.h. Definition at line 131 of file llfloater.cpp. References BUTTON_COUNT, FALSE, i, mAutoFocus, mButtons, mButtonsEnabled, mDragHandle, NULL, S32, and TRUE. Definition at line 143 of file llfloater.cpp. References BUTTON_COUNT, DEFAULT_MIN_HEIGHT, DEFAULT_MIN_WIDTH, FALSE, i, LLPanel::init(), mAutoFocus, mButtons, mButtonsEnabled, NULL, S32, and TRUE. Definition at line 159 of file llfloater.cpp. References BUTTON_COUNT, FALSE, i, LLPanel::init(), mAutoFocus, mButtons, mButtonsEnabled, NULL, S32, and TRUE. Definition at line 179 of file llfloater.cpp. Definition at line 416 of file llfloater.cpp. References FALSE, i, mDragHandle, LLView::mFloaterControls, mResizeBar, mResizeHandle, LLView::mViewHandle, releaseFocus(), S32, setMinimized(), and sFloaterMap. Definition at line 1089 of file llfloater.cpp. Definition at line 1071 of file llfloater.cpp. References LLFloaterView::adjustToFitScreen(), LLFloaterView::bringToFront(), FALSE, LLFloaterView::findNeighboringPosition(), LLPanel::getHandle(), gFloaterView, isFrontmost(), mDependeeHandle, mDependents, LLView::mViewHandle, LLView::setRect(), and setSnapTarget(). Referenced by LLPanelEstateInfo::addAllowedGroup(), addDependentFloater(), LLPanelGroupInvite::impl::callbackClickAdd(), LLFloaterSellLandUI::doSelectAgent(), LLPanelGroupTab::handleClickHelp(), LLPanelLandBan::onClickAdd(), LLPanelLandAccess::onClickAdd(), LLPanelFriends::onClickAddFriend(), LLPrefsVoice::onClickDeviceSettingsBtn(), LLPanelPermissions::onClickGroup(), LLFloaterSnapshot::Impl::onClickKeep(), LLPanelRegionGeneralInfo::onClickKick(), LLPanelEstateInfo::onClickKickUser(), LLFloaterMute::onClickPick(), LLFloaterReporter::onClickSelectAbuser(), LLPanelObjectTools::onClickSet(), LLPanelLandGeneral::onClickSetGroup(), LLTextureCtrl::showPicker(), LLColorSwatchCtrl::showPicker(), and LLInventoryView::toggleFindOptions(). Definition at line 663 of file llfloater.cpp. References LLView::getRect(), llmax(), LLRectBase< Type >::mBottom, LLRectBase< Type >::mLeft, mMinHeight, mMinWidth, LLView::mRect, LLPanel::mRectControl, mResizable, LLView::reshape(), LLUI::sConfigGroup, and LLView::translate(). Referenced by initFloaterXML(), and LLMultiFloater::removeFloater(). Definition at line 1164 of file llfloater.cpp. References LLFloaterView::bringToFront(), getHost(), LLView::getParent(), LLView::getVisible(), LLView::pointInView(), and LLMultiFloater::showFloater(). Referenced by LLPreview::handleMouseDown(), LLFloaterImagePreview::handleMouseDown(), LLFloaterAnimPreview::handleMouseDown(), handleMouseDown(), handleRightMouseDown(), and setFrontmost(). Definition at line 1694 of file llfloater.cpp. References LLView::addChild(), BUTTON_COUNT, CLOSE_BOX_FROM_TOP, FALSE, LLRectBase< Type >::getHeight(), LLRectBase< Type >::getWidth(), i, LLFLOATER_CLOSE_BOX_SIZE, LLPANEL_BORDER_WIDTH, llround(), mButtons, mButtonScale, mDragOnLeft, LLView::mRect, S32, sButtonActiveImageNames, sButtonCallbacks, sButtonNames, sButtonPressedImageNames, sButtonToolTips, LLUI::sColorsGroup, LLView::setFollowsRight(), LLView::setFollowsTop(), LLButton::setHoverImages(), LLButton::setImageColor(), LLView::setSaveToXML(), LLButton::setScaleImage(), LLUICtrl::setTabStop(), LLView::setToolTip(), LLFontGL::sSansSerif, TRUE, and updateButtons(). Reimplemented in LLFloaterAvatarInfo, LLFloaterBuyCurrencyUI, LLFloaterBuyLandUI, LLFloaterGroupInfo, LLFloaterMap, LLFloaterNewIM, LLFloaterTools, LLPreviewGesture, LLPreviewNotecard, LLPreviewLSL, and LLLiveLSLEditor. Definition at line 1495 of file llfloater.cpp. Referenced by LLFloaterView::allChildrenClosed(), close(), LLFloaterView::closeAllChildren(), LLFloaterChatterBox::handleKeyHere(), LLMultiFloater::handleKeyHere(), and LLFloaterPreference::onBtnOK(). Definition at line 1501 of file llfloater.cpp. Definition at line 709 of file llfloater.cpp. References LLView::canSnapTo(), FALSE, LLPanel::getHandle(), LLView::getParent(), getSnapTarget(), llendl, llwarns, mDependents, LLView::mViewHandle, and NULL. Definition at line 648 of file llfloater.cpp. References bottom, LLRectBase< Type >::getHeight(), getHost(), LLView::getRect(), LLRectBase< Type >::getWidth(), gFloaterView, left, LLRectBase< Type >::mBottom, LLRectBase< Type >::mLeft, LLView::mRect, S32, and LLView::translate(). Referenced by LLFloaterGodTools::instance(), LLFloaterAbout::LLFloaterAbout(), LLFloaterDeviceSettings::LLFloaterDeviceSettings(), LLFloaterPay::LLFloaterPay(), LLFloaterTestImpl::LLFloaterTestImpl(), LLFloaterVoiceWizard::LLFloaterVoiceWizard(), LLFloaterTopObjects::show(), LLFloaterReleaseMsg::show(), LLFloaterPreference::show(), LLFloaterParcelInfo::show(), LLFloaterOpenObject::show(), LLFloaterLandHoldings::show(), LLFloaterEventInfo::show(), LLFloaterClassifiedInfo::show(), LLFloaterBuyContents::show(), LLFloaterBuy::show(), LLFloaterAvatarPicker::show(), LLFloaterAvatarInfo::show(), LLFloaterAuction::show(), LLFloaterGroupInvite::showForGroup(), LLFloaterGroupInfo::showFromUUID(), LLFloaterSellLandUI::soleInstance(), LLFloaterBuyLandUI::soleInstance(), LLFloaterBuyCurrencyUI::soleInstance(), and LLFloaterBuyLandUI::updateParcelInfo(). Definition at line 996 of file llfloater.cpp. Definition at line 205 of file llfloater.h. Referenced by LLFloaterView::adjustToFitScreen(), and snappedTo(). Definition at line 539 of file llfloater.cpp. References canClose(), cleanupHandles(), LLFocusMgr::clearLastFocusForGroup(), close(), FALSE, getFloaterByHandle(), getHost(), LLView::getVisible(), gFocusMgr, LLUICtrl::hasFocus(), LLMortician::isDead(), isDependent(), make_ui_sound(), mDependeeHandle, mDependents, LLView::mSoundFlags, onClose(), releaseFocus(), setFocus(), setMinimized(), LLView::SILENT, and TRUE. Referenced by LLFloaterSellLandUI::SelectionObserver::changed(), LLFloaterBuyLandUI::SelectionObserver::changed(), LLPanelGroup::close(), LLFloaterNewIM::close(), close(), LLFloaterView::closeAllChildren(), LLMultiFloater::closeAllFloaters(), LLFloaterProperties::closeByID(), LLTextureCtrl::closeFloater(), closeFocusedFloater(), LLLiveLSLEditor::closeIfNeeded(), LLPreviewLSL::closeIfNeeded(), LLIMMgr::disconnectAllSessions(), LLMenuItemTearOffGL::doIt(), LLFloaterBuyLandUI::draw(), LLFloaterBuyCurrencyUI::draw(), LLMultiFloater::draw(), LLFloaterWorldMap::fly(), LLWorldMapView::handleDoubleClick(), LLVoiceHotkeySelectDialog::handleKey(), LLModalDialog::handleKeyHere(), LLFloaterChatterBox::handleKeyHere(), LLFloaterAvatarPicker::handleKeyHere(), LLMultiFloater::handleKeyHere(), LLPreview::hide(), LLFloaterWorldMap::hide(), LLFloaterSnapshot::hide(), LLFloaterDirectory::hide(), hide(), LLFloaterGroupPicker::ok(), LLFloaterPreference::onBtnCancel(), LLFloaterNameDesc::onBtnCancel(), LLFloaterImport::onBtnCancel(), LLFloaterPreference::onBtnOK(), LLFloaterNameDesc::onBtnOK(), LLFloaterImport::onBtnOK(), LLFloaterAnimPreview::onBtnOK(), LLFloaterBuyContents::onClickBuy(), LLFloaterBuy::onClickBuy(), LLPanelAvatar::onClickCancel(), LLFloaterBuyContents::onClickCancel(), LLFloaterBuy::onClickCancel(), LLFloaterSnapshot::Impl::onClickKeep(), LLPanelRegionGeneralInfo::onClickManageTelehub(), LLPanelAvatar::onClickOK(), LLInventoryViewFinder::onCloseBtn(), onConfirmForceCloseError(), LLFloaterPay::onGive(), LLFloaterWorldMap::onGoHome(), LLPreviewNotecard::onSaveComplete(), LLPreviewGesture::onSaveComplete(), LLMultiFloater::open(), LLFloaterPay::payViaObject(), reset_view_final(), LLColorSwatchCtrl::setEnabled(), LLFloaterScriptSearch::show(), LLFloaterColorPicker::showUI(), LLMultiFloater::tabClose(), LLFloaterMove::toggle(), LLFloaterWorldMap::toggle(), LLFloaterNetwork2080::toggle(), LLFloaterMute::toggle(), LLFloaterMap::toggle(), LLFloaterEventLog::toggle(), LLFloaterAvatarList::toggle(), LLFloaterCamera::toggle(), toggle_map(), LLFloaterDirectory::toggleEvents(), LLFloaterDirectory::toggleFind(), LLInventoryView::toggleFindOptions(), LLInventoryView::toggleVisibility(), LLFloaterGesture::toggleVisibility(), LLFloaterClothing::toggleVisibility(), LLColorSwatchCtrl::~LLColorSwatchCtrl(), and LLScriptEdCore::~LLScriptEdCore(). Definition at line 1340 of file llfloater.cpp. References close(), LLFloaterView::focusFrontFloater(), LLFocusMgr::getKeyboardFocus(), gFloaterView, gFocusMgr, LLUICtrl::hasFocus(), NULL, and sFloaterMap. Definition at line 466 of file llfloater.cpp. Referenced by LLInventoryView::cleanup(), LLFloaterTexturePicker::onClose(), LLPreviewAnim::onClose(), LLTearOffMenu::onClose(), LLInventoryView::onClose(), LLInventoryViewFinder::onClose(), LLFloaterIMPanel::onClose(), LLFloaterSnapshot::onClose(), LLFloaterSellLandUI::onClose(), LLFloaterLandmark::onClose(), LLFloaterLand::onClose(), LLFloaterBuyLandUI::onClose(), LLFloaterBuyCurrencyUI::onClose(), and onClose(). Reimplemented in LLAlertDialog, LLMultiFloater, LLTearOffMenu, LLModalDialog, LLFloaterJoystick, LLDebugVarMessageBox, LLFastTimerView, LLFloaterActiveSpeakers, LLFloaterAnimPreview, LLFloaterAuction, LLFloaterAvatarInfo, LLFloaterAvatarTextures, LLFloaterBuyCurrencyUI, LLFloaterBuyLandUI, LLFloaterChat, LLFloaterChatterBox, LLFloaterColorPicker, LLMakeOutfitDialog, LLFloaterCustomize, LLFloaterEditUI, LLFloaterGodTools, LLFloaterHtml, LLFloaterImagePreview, LLFloaterImport, LLFloaterInspect, LLFloaterLagMeter, LLFloaterLandHoldings, LLFloaterMap, LLFloaterOpenObject, LLFloaterPostcard, LLFloaterPreference, LLFloaterProperties, LLFloaterReporter, LLFloaterSnapshot, LLFloaterTelehub, LLFloaterTools, LLFloaterTOS, LLFloaterTrustNetRate, LLFloaterVoiceWizard, LLFloaterDeviceSettings, LLFloaterWorldMap, LLFloaterIMPanel, LLInventoryViewFinder, LLInventoryView, LLPreviewLandmark, LLPreviewNotecard, LLLiveLSLEditor, LLPreviewTexture, LLFloaterTexturePicker, and LLFloaterSettingsDebug. Definition at line 1384 of file llfloater.cpp. References bottom, LLFocusMgr::childHasKeyboardFocus(), LLView::draw(), LLView::drawChild(), f, FALSE, LLControlGroup::getColor(), LLView::getEnabled(), LLFloaterView::getFloaterByHandle(), LLRectBase< Type >::getHeight(), getHost(), LLUICtrl::getIsChrome(), LLFocusMgr::getKeyboardFocus(), LLView::getParent(), LLView::getRect(), LLResMgr::getRes(), getTitle(), LLView::getVisible(), LLRectBase< Type >::getWidth(), gFloaterView, gFocusMgr, gl_drop_shadow(), gl_rect_2d(), gl_rect_2d_offset_local(), gResMgr, left, LLFONT_SANSSERIF, LLPANEL_BORDER_WIDTH, llround(), LLPanel::mBgColorAlpha, LLPanel::mBgColorOpaque, LLPanel::mBgOpaque, LLPanel::mBgVisible, mCanTearOff, LLPanel::mDefaultBtn, mLastHostHandle, LLView::mRect, LLColor4::mV, r, right, S32, LLUI::sColorsGroup, LLUI::sConfigGroup, LLButton::setBorderEnabled(), setCanTearOff(), LLUI::setLineWidth(), LLView::setVisible(), top, TRUE, VALPHA, and WIDGET_TYPE_BUTTON. Referenced by LLFloaterSettingsDebug::draw(), LLFloaterTexturePicker::draw(), LLPreviewTexture::draw(), LLLiveLSLEditor::draw(), LLPreviewNotecard::draw(), LLPreviewLandmark::draw(), LLModalDialog::draw(), LLTearOffMenu::draw(), LLInventoryView::draw(), LLInventoryViewFinder::draw(), LLFloaterIMPanel::draw(), LLFloaterWorldMap::draw(), LLFloaterDeviceSettings::draw(), LLFloaterVoiceWizard::draw(), LLFloaterTrustNetRate::draw(), LLFloaterTools::draw(), LLFloaterTelehub::draw(), LLFloaterSnapshot::draw(), LLFloaterReporter::draw(), LLFloaterProperties::draw(), LLFloaterPreference::draw(), LLFloaterPostcard::draw(), LLFloaterOpenObject::draw(), LLFloaterMap::draw(), LLFloaterLandHoldings::draw(), LLFloaterLagMeter::draw(), LLFloaterInspect::draw(), LLFloaterImport::draw(), LLFloaterImagePreview::draw(), LLFloaterHtml::draw(), LLFloaterGodTools::draw(), LLFloaterEditUI::draw(), LLFloaterCustomize::draw(), LLFloaterColorPicker::draw(), LLFloaterChatterBox::draw(), LLFloaterChat::draw(), LLFloaterBuyLandUI::draw(), LLFloaterBuyCurrencyUI::draw(), LLFloaterAvatarTextures::draw(), LLFloaterAvatarInfo::draw(), LLFloaterAuction::draw(), LLFloaterAnimPreview::draw(), LLFloaterActiveSpeakers::draw(), LLMultiFloater::draw(), LLDebugVarMessageBox::draw(), LLFloaterJoystick::draw(), and LLFloaterReleaseMsg::show(). Definition at line 2994 of file llfloater.cpp. References LLUICtrlFactory::buildFloater(), initFloaterXML(), and LLFloater(). Definition at line 155 of file llfloater.h. Definition at line 1250 of file llfloater.cpp. Definition at line 1210 of file llfloater.cpp. References LLMortician::isDead(), NULL, and sFloaterMap. 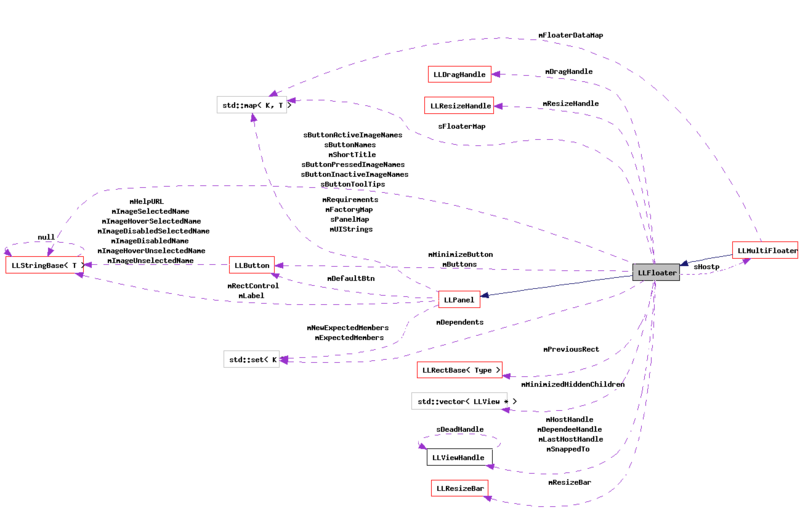 Referenced by addDependentFloater(), LLScriptEdCore::addHelpItemToHistory(), LLFloaterView::bringToFront(), LLPanelLandGeneral::buyPassDialogVisible(), cleanupHandles(), close(), LLTextureCtrl::closeFloater(), LLIMMgr::disconnectAllSessions(), LLMenuItemTearOffGL::doIt(), LLPreviewAnim::endAnimCallback(), LLIMMgr::findFloaterBySession(), LLFloaterView::findNeighboringPosition(), getDependee(), LLInventoryView::getFinder(), LLPreview::getFirstPreviewForSource(), getHost(), LLScriptEdCore::onBtnDynamicHelp(), LLScriptEdCore::onClickBack(), LLScriptEdCore::onClickForward(), onClickTearOff(), LLColorSwatchCtrl::onColorChanged(), LLTextureCtrl::onFloaterClose(), LLTextureCtrl::onFloaterCommit(), LLScriptEdCore::onHelpComboCommit(), LLUICtrlFactory::rebuild(), LLColorSwatchCtrl::set(), LLTextureCtrl::setCanApplyImmediately(), LLTextureCtrl::setEnabled(), LLColorSwatchCtrl::setEnabled(), LLScriptEdCore::setHelpPage(), LLTextureCtrl::setImageAssetID(), setMinimized(), LLColorSwatchCtrl::setOriginal(), LLTextureCtrl::setValid(), LLColorSwatchCtrl::setValid(), setVisible(), LLTextureCtrl::showPicker(), LLColorSwatchCtrl::showPicker(), LLScriptEdCore::updateDynamicHelp(), userSetShape(), and LLColorSwatchCtrl::~LLColorSwatchCtrl(). Definition at line 218 of file llfloater.h. Referenced by LLTabContainerCommon::fromXML(), initFloaterXML(), LLTaskLSLBridge::openItem(), LLPreview::show(), and LLFloaterProperties::show(). Definition at line 145 of file llfloater.h. Referenced by LLFloaterIMPanel::addHistoryLine(), LLFloaterView::bringToFront(), bringToFront(), LLFloaterNewIM::canClose(), center(), LLFloaterNewIM::close(), close(), draw(), LLFloaterChat::hideInstance(), LLMultiFloater::isFloaterFlashing(), LLFloaterScriptQueue::LLFloaterScriptQueue(), LLFloaterScriptSearch::LLFloaterScriptSearch(), LLLiveLSLEditor::LLLiveLSLEditor(), LLPreviewAnim::LLPreviewAnim(), LLPreviewLSL::LLPreviewLSL(), LLPreviewNotecard::LLPreviewNotecard(), LLPreviewSound::LLPreviewSound(), LLPreviewTexture::LLPreviewTexture(), LLFloaterGesture::onClickEdit(), LLPreview::open(), open(), LLMultiFloater::removeFloater(), LLMultiFloater::setFloaterFlashing(), setFocus(), setFrontmost(), LLFloaterIMPanel::setVisible(), LLPreview::show(), LLFloaterProperties::show(), show(), and LLPreviewTexture::updateAspectRatio(). Definition at line 176 of file llfloater.h. Referenced by getXML(), initFloaterXML(), and LLMultiFloater::updateResizeLimits(). Definition at line 175 of file llfloater.h. Definition at line 168 of file llfloater.h. Definition at line 695 of file llfloater.cpp. References LLDragHandle::getTitle(), mDragHandle, mShortTitle, and LLStringBase< char >::null. Definition at line 206 of file llfloater.h. Definition at line 685 of file llfloater.cpp. References LLDragHandle::getTitle(), mDragHandle, and LLStringBase< char >::null. Referenced by LLFloaterIMPanel::addHistoryLine(), draw(), getXML(), handle_save_to_xml(), LLAlertDialog::hasTitleBar(), LLFloaterIMPanel::init(), initFloaterXML(), LLFloaterReleaseMsg::LLFloaterReleaseMsg(), LLViewerForceCloseChatterBoxSession::post(), LLViewerChatterBoxSessionEventReply::post(), LLViewerChatterBoxSessionStartReply::post(), LLFloaterGesture::postBuild(), and LLFloaterAvatarTextures::postBuild(). Reimplemented in LLMultiFloater, and LLFastTimerView. Definition at line 461 of file llfloater.cpp. Definition at line 455 of file llfloater.cpp. Definition at line 2970 of file llfloater.cpp. References getMinHeight(), getMinWidth(), getTitle(), LLPanel::getXML(), isCloseable(), isDragOnLeft(), isMinimizeable(), isResizable(), mCanTearOff, and TRUE. Definition at line 1157 of file llfloater.cpp. References FALSE, LLView::handleDoubleClick(), mMinimized, and setMinimized(). Reimplemented in LLModalDialog, LLFastTimerView, LLFloaterAnimPreview, LLFloaterColorPicker, LLFloaterImagePreview, LLFloaterImport, and LLPreview. Definition at line 1105 of file llfloater.cpp. References bringToFront(), BUTTON_CLOSE, BUTTON_RESTORE, LLView::getRect(), LLView::handleMouseDown(), LLDragHandle::handleMouseDown(), LLRectBase< Type >::mBottom, mButtons, mButtonsEnabled, mDragHandle, LLRectBase< Type >::mLeft, mMinimized, LLView::pointInView(), S32, and TRUE. Referenced by LLPreview::handleMouseDown(), LLModalDialog::handleMouseDown(), LLFloaterImport::handleMouseDown(), LLFloaterImagePreview::handleMouseDown(), LLFloaterColorPicker::handleMouseDown(), and LLFloaterAnimPreview::handleMouseDown(). Reimplemented in LLModalDialog, and LLFastTimerView. Definition at line 1148 of file llfloater.cpp. References bringToFront(), LLView::handleRightMouseDown(), and mMinimized. Definition at line 1269 of file llfloater.cpp. Definition at line 201 of file llfloater.cpp. References LLPanel::addBorder(), LLView::addChild(), LLResizeBar::BOTTOM, buildButtons(), BUTTON_CLOSE, BUTTON_COUNT, BUTTON_MINIMIZE, LLView::deleteAllChildren(), DRAG_HANDLE_WIDTH, FALSE, LLRectBase< Type >::getHeight(), LLUICtrl::getIsChrome(), LLView::getParent(), LLRectBase< Type >::getWidth(), gFloaterView, i, LLResizeBar::LEFT, LLResizeHandle::LEFT_BOTTOM, LLResizeHandle::LEFT_TOP, LLFLOATER_CLOSE_BOX_SIZE, LLPANEL_BORDER_WIDTH, LLPanel::mBorder, mButtons, mButtonScale, mButtonsEnabled, mCanTearOff, mDragHandle, mDragOnLeft, mEditing, mFirstLook, mForeground, mHasBeenDraggedWhileMinimized, LLView::mIsFocusRoot, mMinHeight, mMinimized, mMinWidth, mPreviousMinimizedBottom, mPreviousMinimizedLeft, mPreviousRect, LLView::mRect, mResizable, mResizeBar, mResizeHandle, LLView::mViewHandle, NULL, LLView::removeChild(), RESIZE_HANDLE_HEIGHT, RESIZE_HANDLE_WIDTH, LLResizeBar::RIGHT, LLResizeHandle::RIGHT_BOTTOM, LLResizeHandle::RIGHT_TOP, S32, S32_MAX, LLRectBase< Type >::set(), LLPanel::setBackgroundVisible(), LLView::setMouseOpaque(), LLRectBase< Type >::setOriginAndSize(), setVisible(), sFloaterMap, LLResizeBar::TOP, and TRUE. Definition at line 3018 of file llfloater.cpp. References applyRectControl(), LLView::createRect(), getFloaterHost(), getMinHeight(), getMinWidth(), LLView::getName(), getShortTitle(), getTitle(), LLPanel::init(), LLPanel::initChildrenXML(), LLUICtrl::initFromXML(), isCloseable(), isDragOnLeft(), isMinimizeable(), isResizable(), llendl, llerrs, moveResizeHandlesToFront(), open(), LLPanel::postBuild(), S32, setCanTearOff(), setFloaterHost(), LLView::setName(), LLView::setRect(), LLPanel::setRectControl(), and setShortTitle(). Referenced by LLUICtrlFactory::buildFloater(), and fromXML(). Definition at line 173 of file llfloater.h. Referenced by getXML(), LLFloaterChatterBox::handleKeyHere(), LLMultiFloater::handleKeyHere(), LLAlertDialog::hasTitleBar(), and initFloaterXML(). Definition at line 159 of file llfloater.h. Referenced by LLFloaterView::bringToFront(), close(), and LLFloaterView::reshape(). Definition at line 174 of file llfloater.h. Referenced by getXML(), and initFloaterXML(). Definition at line 1066 of file llfloater.cpp. References LLFloaterView::getFrontmost(), LLView::getVisible(), and gFloaterView. Referenced by addDependentFloater(), LLPanelEditWearable::draw(), LLFloaterColorPicker::handleHover(), LLFloaterWorldMap::handleScrollWheel(), and setFocus(). Definition at line 171 of file llfloater.h. Referenced by getXML(), LLAlertDialog::hasTitleBar(), and initFloaterXML(). Definition at line 157 of file llfloater.h. Referenced by LLFloaterView::adjustToFitScreen(), LLFloaterTexturePicker::draw(), LLFloaterTelehub::draw(), LLFloaterCustomize::draw(), LLScrollingPanelParam::draw(), LLPanelEditWearable::draw(), LLFloaterChatterBox::draw(), LLFloaterAuction::draw(), LLMultiFloater::growToFit(), LLViewerWindow::handlePerFrameHover(), LLFloaterWorldMap::handleScrollWheel(), open(), LLLiveLSLEditor::reshape(), LLPreviewLSL::reshape(), LLPreviewNotecard::reshape(), setCanMinimize(), LLPreviewGesture::setMinimized(), LLFloaterTools::updatePopup(), LLMultiFloater::updateResizeLimits(), userSetShape(), and visible(). Definition at line 166 of file llfloater.h. Referenced by LLFloaterView::adjustToFitScreen(), getXML(), and initFloaterXML(). Definition at line 1047 of file llfloater.cpp. References i, mResizeBar, mResizeHandle, S32, and LLView::sendChildToFront(). Referenced by LLFloaterScriptDebug::addOutputWindow(), initFloaterXML(), and LLFloaterDirectory::LLFloaterDirectory(). Reimplemented in LLFloaterHtml, LLFloaterNewIM, LLFloaterReleaseMsg, and LLFloaterIMPanel. Definition at line 1374 of file llfloater.cpp. Definition at line 1331 of file llfloater.cpp. Definition at line 1285 of file llfloater.cpp. Definition at line 1293 of file llfloater.cpp. References LLView::addChild(), LLFloaterView::adjustToFitScreen(), FALSE, getFloaterByHandle(), LLView::getRect(), gFloaterView, LLFLOATER_HEADER_SIZE, LLRectBase< Type >::mLeft, LLRectBase< Type >::mTop, LLMultiFloater::open(), LLMultiFloater::removeFloater(), LLRectBase< Type >::setLeftTopAndSize(), LLMultiFloater::showFloater(), and TRUE. Reimplemented in LLMultiFloater, LLTearOffMenu, LLModalDialog, LLFloaterCamera, LLDebugVarMessageBox, LLFloaterActiveSpeakers, LLFloaterAuction, LLFloaterAvatarList, LLFloaterBuyCurrencyUI, LLFloaterBuyLandUI, LLFloaterChat, LLFloaterMyFriends, LLFloaterChatterBox, LLFloaterClothing, LLFloaterColorPicker, LLFloaterCustomize, LLFloaterDirectory, LLFloaterEventLog, LLFloaterGodTools, LLFloaterHtml, LLFloaterLand, LLFloaterLandmark, LLFloaterMap, LLFloaterMute, LLFloaterPermissionsMgr, LLFloaterNetwork2080, LLFloaterScriptDebug, LLFloaterSellLandUI, LLFloaterSnapshot, LLFloaterTools, LLFloaterVoiceWizard, LLFloaterDeviceSettings, LLFloaterWorldMap, LLFloaterIMPanel, LLInventoryViewFinder, LLInventoryView, LLFloaterMove, LLPreviewAnim, LLPreviewGesture, and LLFloaterTexturePicker. Definition at line 1489 of file llfloater.cpp. Referenced by close(), LLPreviewGesture::onClose(), LLFloaterMove::onClose(), LLModalDialog::onClose(), LLFloaterVoiceWizard::onClose(), LLFloaterSellLandUI::onClose(), LLFloaterColorPicker::onClose(), LLFloaterClothing::onClose(), LLFloaterBuyLandUI::onClose(), LLFloaterBuyCurrencyUI::onClose(), LLMultiFloater::onClose(), and LLFloaterCamera::onClose(). Reimplemented in LLFloaterChatterBox, LLFloaterTools, LLFloaterVoiceWizard, and LLFloaterDeviceSettings. Definition at line 1484 of file llfloater.cpp. Referenced by LLFloaterDeviceSettings::onOpen(), LLFloaterVoiceWizard::onOpen(), and open(). Reimplemented in LLMultiFloater, LLMultiPreview, LLPreview, LLFloaterScriptSearch, LLPreviewLSL, and LLLiveLSLEditor. Definition at line 505 of file llfloater.cpp. References LLMultiFloater::addFloater(), FALSE, getHost(), LLView::getVisible(), isMinimized(), make_ui_sound(), mAutoFocus, LLView::mSoundFlags, NULL, onOpen(), setMinimized(), setVisibleAndFrontmost(), sHostp, LLMultiFloater::showFloater(), and LLView::SILENT. Referenced by LLIMMgr::addSession(), LLFloaterBuyCurrency::buyCurrency(), LLFloaterBuyLand::buyLand(), LLTearOffMenu::create(), LLFloaterNotRunQueue::create(), LLFloaterRunQueue::create(), LLFloaterResetQueue::create(), LLFloaterCompileQueue::create(), LLObjectEdit::handleEvent(), LLNewWindow::handleEvent(), LLViewerWindow::handlePerFrameHover(), initFloaterXML(), LLFloaterGodTools::instance(), LLFloaterPay::LLFloaterPay(), LLFloaterTestImpl::LLFloaterTestImpl(), LLPrefsVoice::onClickDeviceSettingsBtn(), LLLiveLSLEditor::open(), LLPreviewLSL::open(), LLFloaterScriptSearch::open(), LLPreview::open(), LLMultiFloater::open(), LLFloaterSellLand::sellLand(), LLMorphView::setVisible(), LLFloaterSettingsDebug::show(), LLFloaterMove::show(), LLFloaterWorldMap::show(), LLFloaterSnapshot::show(), LLFloaterScriptDebugOutput::show(), LLFloaterSaveAvatar::show(), LLFloaterReleaseMsg::show(), LLFloaterRegionInfo::show(), LLFloaterProperties::show(), LLFloaterNetwork2080::show(), LLFloaterPreference::show(), LLFloaterPermissionsMgr::show(), LLFloaterParcelInfo::show(), LLFloaterOpenObject::show(), LLFloaterMute::show(), LLFloaterLandHoldings::show(), LLFloaterLand::show(), LLFloaterLagMeter::show(), LLFloaterInspect::show(), LLFloaterGodTools::show(), LLFloaterGesture::show(), LLFloaterEventLog::show(), LLFloaterEventInfo::show(), LLFloaterClassifiedInfo::show(), LLFloaterBuyContents::show(), LLFloaterBuy::show(), LLFloaterBump::show(), LLFloaterBuildOptions::show(), LLFloaterAvatarTextures::show(), LLFloaterAvatarPicker::show(), LLFloaterAvatarList::show(), LLFloaterAuction::show(), LLFloaterAbout::show(), show(), LLDebugVarMessageBox::show(), LLFloaterJoystick::show(), LLFloaterCamera::show(), LLAlertDialog::show(), LLInventoryView::showAgentInventory(), LLFloaterGroupInvite::showForGroup(), LLFloaterPostcard::showFromSnapshot(), LLFloaterGroupInfo::showFromUUID(), LLFloaterChatterBox::showInstance(), LLFloaterGodTools::showPanel(), LLFloaterDirectory::showPanel(), LLTextureCtrl::showPicker(), LLTaskInvFVBridge::showProperties(), LLFloaterColorPicker::showUI(), LLFloaterMap::toggle(), toggle_map(), LLFloaterDirectory::toggleEvents(), LLFloaterDirectory::toggleFind(), and LLInventoryView::toggleFindOptions(). Definition at line 603 of file llfloater.cpp. References LLFocusMgr::childHasKeyboardFocus(), LLFocusMgr::childHasMouseCapture(), LLFocusMgr::childIsTopCtrl(), gFocusMgr, NULL, LLFocusMgr::setKeyboardFocus(), LLFocusMgr::setMouseCapture(), and LLFocusMgr::setTopCtrl(). Referenced by close(), setForeground(), setMinimized(), and ~LLFloater(). Definition at line 1098 of file llfloater.cpp. References LLPanel::getHandle(), mDependeeHandle, mDependents, and LLViewHandle::sDeadHandle. Definition at line 1507 of file llfloater.cpp. Definition at line 134 of file llfloater.h. Definition at line 1542 of file llfloater.cpp. References BUTTON_CLOSE, mButtonsEnabled, and updateButtons(). Referenced by LLFloaterChatterBox::addFloater(), LLFloaterScriptDebugOutput::addLine(), and LLFloaterChatterBox::removeFloater(). Definition at line 1637 of file llfloater.cpp. References FALSE, LLView::getEnabled(), mDragHandle, LLView::setEnabled(), and TRUE. Definition at line 1511 of file llfloater.cpp. References BUTTON_MINIMIZE, BUTTON_RESTORE, FALSE, isMinimized(), mButtonsEnabled, setMinimized(), TRUE, and updateButtons(). Referenced by LLFloaterLandmark::LLFloaterLandmark(), LLFloaterTexturePicker::LLFloaterTexturePicker(), and LLMultiFloater::removeFloater(). Definition at line 1558 of file llfloater.cpp. References LLView::addChild(), LLResizeBar::BOTTOM, LLRectBase< Type >::getHeight(), LLRectBase< Type >::getWidth(), i, LLResizeBar::LEFT, LLResizeHandle::LEFT_BOTTOM, LLResizeHandle::LEFT_TOP, mMinHeight, mMinWidth, LLView::mRect, mResizable, mResizeBar, mResizeHandle, NULL, LLView::removeChild(), RESIZE_HANDLE_HEIGHT, RESIZE_HANDLE_WIDTH, LLResizeBar::RIGHT, LLResizeHandle::RIGHT_BOTTOM, LLResizeHandle::RIGHT_TOP, S32, S32_MAX, LLResizeBar::TOP, and TRUE. Referenced by LLMultiFloater::removeFloater(), and LLMultiFloater::setCanResize(). Definition at line 1549 of file llfloater.cpp. References BUTTON_TEAR_OFF, LLViewHandle::isDead(), mButtonsEnabled, mCanTearOff, mHostHandle, and updateButtons(). Referenced by LLFloaterScriptDebugOutput::addLine(), draw(), and initFloaterXML(). Definition at line 1228 of file llfloater.cpp. References BUTTON_EDIT, count, S32, sEditModeEnabled, and sFloaterMap. Definition at line 215 of file llfloater.h. Referenced by LLFloaterScriptDebug::addOutputWindow(), doToSelected(), initFloaterXML(), LLTaskLSLBridge::openItem(), LLFolderView::openSelectedItems(), and LLFolderView::propertiesSelectedItems(). Definition at line 927 of file llfloater.cpp. References LLFocusMgr::childHasKeyboardFocus(), getHost(), LLUICtrl::getIsChrome(), LLFocusMgr::getLastFocusForGroup(), LLView::getParent(), gFocusMgr, isFrontmost(), LLView::isInEnabledChain(), LLView::isInVisibleChain(), LLUICtrl::setFocus(), LLPanel::setFocus(), setFrontmost(), and TRUE. Referenced by LLFloaterView::bringToFront(), close(), LLMenuItemTearOffGL::doIt(), LLModalDialog::draw(), LLEmbeddedNotecardOpener::fire(), LLFloaterView::focusFrontFloater(), LLFloaterGodTools::instance(), LLScriptEdCore::onBtnDynamicHelp(), open_landmark(), open_notecard(), open_texture(), LLTaskAnimationBridge::openItem(), LLTaskNotecardBridge::openItem(), LLTaskTextureBridge::openItem(), LLLSLTextBridge::openItem(), LLAnimationBridge::openItem(), LLGestureBridge::openItem(), LLSoundBridge::openSoundPreview(), setAutoFocus(), LLVoiceHotkeySelectDialog::setFocus(), setIsChrome(), LLModalDialog::setVisible(), LLPreviewGesture::show(), LLPreview::show(), LLFloaterOpenObject::show(), LLFloaterBuyContents::show(), LLFloaterBuy::show(), LLFloaterAuction::show(), LLAlertDialog::show(), LLTextureCtrl::showPicker(), LLColorSwatchCtrl::showPicker(), LLFloaterColorPicker::showUI(), LLModalDialog::startModal(), and LLFloaterInspect::~LLFloaterInspect(). Definition at line 980 of file llfloater.cpp. References mDragHandle, mForeground, releaseFocus(), LLPanel::setBackgroundOpaque(), and LLDragHandle::setForeground(). Definition at line 1192 of file llfloater.cpp. References bringToFront(), getHost(), LLView::getParent(), and LLMultiFloater::showFloater(). Referenced by LLFloaterClassifiedInfo::displayClassifiedInfo(), LLFloaterEventInfo::displayEventInfo(), LLFloaterURLDisplay::displayParcelInfo(), LLVoiceHotkeySelectDialog::handleKey(), setFocus(), setVisibleAndFrontmost(), LLFloaterParcelInfo::show(), LLFloaterEventInfo::show(), and LLFloaterClassifiedInfo::show(). Definition at line 1014 of file llfloater.cpp. References BUTTON_TEAR_OFF, f, FALSE, LLPanel::getHandle(), LLViewHandle::isDead(), LLViewHandle::markDead(), mButtonScale, mButtonsEnabled, mCanTearOff, mHostHandle, LLView::mIsFocusRoot, mLastHostHandle, TRUE, and updateButtons(). Definition at line 962 of file llfloater.cpp. References FALSE, mDragHandle, LLView::mIsFocusRoot, setFocus(), LLUICtrl::setIsChrome(), and LLDragHandle::setTitleVisible(). Referenced by LLFloaterCamera::LLFloaterCamera(), LLFloaterLagMeter::LLFloaterLagMeter(), LLFloaterMap::LLFloaterMap(), and LLFloaterMove::LLFloaterMove(). Definition at line 800 of file llfloater.cpp. References bottom, BUTTON_MINIMIZE, BUTTON_RESTORE, FALSE, LLView::getChildList(), getFloaterByHandle(), LLRectBase< Type >::getHeight(), LLFloaterView::getMinimizePosition(), LLView::getRect(), LLRectBase< Type >::getWidth(), gFloaterView, left, LLFLOATER_HEADER_SIZE, make_ui_sound(), LLRectBase< Type >::mBottom, mButtonsEnabled, mDependents, mDragHandle, mHasBeenDraggedWhileMinimized, MINIMIZED_WIDTH, LLRectBase< Type >::mLeft, mMinimized, mMinimizedHiddenChildren, mPreviousMinimizedBottom, mPreviousMinimizedLeft, mPreviousRect, LLView::mRect, releaseFocus(), LLView::reshape(), S32, LLPanel::setBorderVisible(), setMinimized(), LLView::setOrigin(), LLView::setVisible(), TRUE, and updateButtons(). Referenced by LLFloaterView::bringToFront(), close(), handleDoubleClick(), LLFloaterTools::onClose(), open(), LLFloaterAvatarList::processARQueue(), setCanMinimize(), LLPreviewGesture::setMinimized(), setMinimized(), and ~LLFloater(). Definition at line 622 of file llfloater.cpp. References i, LLResizeBar::LEFT, mMinHeight, mMinWidth, mResizeBar, mResizeHandle, LLResizeBar::RIGHT, S32, S32_MAX, LLResizeHandle::setResizeLimits(), and LLResizeBar::setResizeLimits(). Definition at line 690 of file llfloater.cpp. Definition at line 204 of file llfloater.h. Referenced by addDependentFloater(), and snappedTo(). Definition at line 676 of file llfloater.cpp. References gNoRender, mDragHandle, and LLDragHandle::setTitle(). Referenced by LLFloaterScriptDebugOutput::addLine(), LLFloaterGroupInfo::callbackLoadGroupName(), LLInventoryView::changed(), LLLiveLSLEditor::draw(), LLInventoryView::draw(), LLFloaterTrustNetRate::draw(), LLFloaterTopObjects::handleReply(), LLFloaterIMPanel::init(), LLAlertDialog::LLAlertDialog(), LLFloaterAbout::LLFloaterAbout(), LLFloaterScriptQueue::LLFloaterScriptQueue(), LLLiveLSLEditor::LLLiveLSLEditor(), LLPreviewAnim::LLPreviewAnim(), LLPreviewLSL::LLPreviewLSL(), LLPreviewNotecard::LLPreviewNotecard(), LLPreviewSound::LLPreviewSound(), LLPreviewTexture::LLPreviewTexture(), LLFloaterTexturePicker::postBuild(), LLFloaterNameDesc::postBuild(), LLFloaterImport::postBuild(), LLFloaterGesture::postBuild(), LLFloaterAnimPreview::postBuild(), LLFloaterAvatarTextures::refresh(), LLPreview::rename(), LLFloaterReleaseMsg::show(), LLFloaterHtml::show(), LLFloaterBuy::show(), LLInventoryView::showAgentInventory(), LLInventoryViewFinder::updateElementsFromFilter(), and LLFloaterTexturePicker::updateImageStats(). Reimplemented in LLAlertDialog, LLMultiFloater, LLModalDialog, LLFloaterChat, LLFloaterDirectory, LLFloaterMap, LLFloaterWorldMap, LLFloaterIMPanel, and LLInventoryView. Definition at line 471 of file llfloater.cpp. References LLFocusMgr::childHasMouseCapture(), LLFocusMgr::childIsTopCtrl(), FALSE, getFloaterByHandle(), gFocusMgr, mDependents, mFirstLook, NULL, LLFocusMgr::setMouseCapture(), LLFocusMgr::setTopCtrl(), setVisible(), and LLView::setVisible(). Referenced by LLFloaterColorPicker::cancelSelection(), LLFloaterColorPicker::createUI(), LLFloaterURLDisplay::displayParcelInfo(), LLViewerWindow::handlePerFrameHover(), idle_startup(), init(), LLViewerWindow::initWorldUI(), LLDebugView::LLDebugView(), LLFastTimerView::LLFastTimerView(), LLFloaterAvatarList::LLFloaterAvatarList(), LLFloaterEventLog::LLFloaterEventLog(), LLFloaterMute::LLFloaterMute(), LLFloaterNetwork2080::LLFloaterNetwork2080(), LLFloaterReporter::LLFloaterReporter(), LLFloaterURLDisplay::LLFloaterURLDisplay(), LLInventoryView::onClose(), LLFloaterDeviceSettings::onClose(), LLFloaterTools::onClose(), LLFloaterNetwork2080::onClose(), LLFloaterPermissionsMgr::onClose(), LLFloaterMute::onClose(), LLFloaterMap::onClose(), LLFloaterHtml::onClose(), LLFloaterGodTools::onClose(), LLFloaterEventLog::onClose(), LLFloaterMyFriends::onClose(), LLFloaterAvatarList::onClose(), LLFloaterAuction::onClose(), LLFloaterActiveSpeakers::onClose(), LLDebugVarMessageBox::onClose(), LLFloaterTools::postBuild(), LLFloaterPostcard::sendPostcard(), LLModalDialog::setVisible(), LLInventoryView::setVisible(), LLFloaterWorldMap::setVisible(), LLFloaterMap::setVisible(), LLFloaterDirectory::setVisible(), LLFloaterChat::setVisible(), LLMultiFloater::setVisible(), setVisible(), setVisibleAndFrontmost(), and LLFloaterColorPicker::showUI(). Definition at line 1186 of file llfloater.cpp. References setFrontmost(), setVisible(), and TRUE. Referenced by open(), LLFloaterTopObjects::show(), LLFloaterTelehub::show(), LLFloaterReleaseMsg::show(), LLFloaterHtml::show(), and LLFloaterClothing::show(). Definition at line 1256 of file llfloater.cpp. References getHost(), LLMultiFloater::open(), and open(). Definition at line 731 of file llfloater.cpp. References clearSnapTarget(), LLPanel::getHandle(), LLView::getParent(), and setSnapTarget(). Definition at line 1651 of file llfloater.cpp. References BUTTON_COUNT, BUTTON_RESTORE, CLOSE_BOX_FROM_TOP, FALSE, LLRectBase< Type >::getHeight(), LLRectBase< Type >::getWidth(), i, LLFLOATER_CLOSE_BOX_SIZE, LLPANEL_BORDER_WIDTH, llround(), mButtons, mButtonScale, mButtonsEnabled, mDragHandle, mDragOnLeft, LLView::mRect, S32, LLView::setEnabled(), LLRectBase< Type >::setLeftTopAndSize(), LLDragHandle::setMaxTitleWidth(), LLView::setRect(), LLUICtrl::setTabStop(), LLView::setVisible(), and TRUE. Referenced by buildButtons(), setCanClose(), setCanMinimize(), setCanTearOff(), setHost(), and setMinimized(). Reimplemented in LLMultiPreview, and LLPreview. Definition at line 746 of file llfloater.cpp. References getFloaterByHandle(), LLRectBase< Type >::getHeight(), LLRectBase< Type >::getWidth(), isMinimized(), LLRectBase< Type >::mBottom, mDependents, mHasBeenDraggedWhileMinimized, LLRectBase< Type >::mLeft, LLView::mRect, LLRectBase< Type >::mRight, LLRectBase< Type >::mTop, LLView::mViewHandle, S32, LLRectBase< Type >::translate(), TRUE, and LLView::userSetShape(). Referenced by LLMultiPreview::userSetShape(), and LLPreview::userSetShape(). Definition at line 1275 of file llfloater.cpp. References FALSE, LLView::isInVisibleChain(), and isMinimized(). Referenced by LLFloaterVisible::handleEvent(), and LLFloaterWorldMap::toggle(). Definition at line 76 of file llfloater.h. Definition at line 258 of file llfloater.h. Referenced by LLFloater(), LLFloaterAvatarInfo::LLFloaterAvatarInfo(), LLFloaterTools::LLFloaterTools(), LLPreview::LLPreview(), open(), and setAutoFocus(). Definition at line 267 of file llfloater.h. Referenced by buildButtons(), handleMouseDown(), init(), LLFloater(), and updateButtons(). Definition at line 268 of file llfloater.h. Referenced by buildButtons(), init(), setHost(), and updateButtons(). Definition at line 266 of file llfloater.h. Referenced by handleMouseDown(), init(), isCloseable(), isMinimizeable(), LLFloater(), setCanClose(), setCanMinimize(), setCanTearOff(), setHost(), setMinimized(), and updateButtons(). Definition at line 245 of file llfloater.h. Referenced by draw(), getXML(), init(), setCanTearOff(), and setHost(). Definition at line 249 of file llfloater.h. Referenced by addDependentFloater(), close(), getDependee(), isDependent(), and removeDependentFloater(). Definition at line 263 of file llfloater.h. Referenced by addDependentFloater(), LLFloaterView::bringToFront(), canSnapTo(), cleanupHandles(), close(), LLFloaterView::findNeighboringPosition(), removeDependentFloater(), LLFloaterView::reshape(), setMinimized(), setVisible(), and userSetShape(). Definition at line 241 of file llfloater.h. Referenced by LLFloaterTexturePicker::draw(), LLFloaterWorldMap::draw(), LLFloaterMap::draw(), LLFloaterColorPicker::draw(), getShortTitle(), getTitle(), handleMouseDown(), init(), LLFloater(), LLFloaterMap::LLFloaterMap(), LLFloaterTools::postBuild(), setCanDrag(), setForeground(), setIsChrome(), setMinimized(), setTitle(), updateButtons(), and ~LLFloater(). Definition at line 264 of file llfloater.h. Referenced by buildButtons(), init(), isDragOnLeft(), and updateButtons(). Definition at line 259 of file llfloater.h. Definition at line 252 of file llfloater.h. Referenced by init(), and setVisible(). Definition at line 248 of file llfloater.h. Referenced by LLFloaterColorPicker::handleMouseDown(), init(), and setForeground(). Definition at line 291 of file llfloater.h. Referenced by init(), setMinimized(), and userSetShape(). Definition at line 272 of file llfloater.h. Referenced by getHost(), setCanTearOff(), and setHost(). Definition at line 273 of file llfloater.h. Referenced by draw(), and setHost(). Definition at line 256 of file llfloater.h. Referenced by applyRectControl(), getMinHeight(), getResizeLimits(), init(), setCanResize(), and setResizeLimits(). Definition at line 244 of file llfloater.h. Definition at line 246 of file llfloater.h. Referenced by LLPreviewTexture::draw(), LLFloaterSnapshot::draw(), LLFloaterPostcard::draw(), handleDoubleClick(), handleMouseDown(), handleRightMouseDown(), init(), isMinimized(), and setMinimized(). Definition at line 289 of file llfloater.h. Definition at line 255 of file llfloater.h. Referenced by applyRectControl(), getMinWidth(), getResizeLimits(), init(), setCanResize(), and setResizeLimits(). Definition at line 292 of file llfloater.h. Referenced by init(), and setMinimized(). Definition at line 293 of file llfloater.h. Definition at line 247 of file llfloater.h. Referenced by LLMultiFloater::growToFit(), init(), setMinimized(), and LLMultiFloater::updateResizeLimits(). Definition at line 254 of file llfloater.h. Referenced by applyRectControl(), init(), isResizable(), LLMultiFloater::LLMultiFloater(), LLMultiFloater::setCanResize(), and setCanResize(). Definition at line 242 of file llfloater.h. Referenced by init(), moveResizeHandlesToFront(), setCanResize(), setResizeLimits(), and ~LLFloater(). Definition at line 243 of file llfloater.h. Definition at line 250 of file llfloater.h. Referenced by getShortTitle(), and setShortTitle(). Definition at line 270 of file llfloater.h. Referenced by clearSnapTarget(), getSnapTarget(), and setSnapTarget(). Definition at line 277 of file llfloater.h. Definition at line 283 of file llfloater.h. Definition at line 278 of file llfloater.h. Definition at line 280 of file llfloater.h. Definition at line 279 of file llfloater.h. Definition at line 281 of file llfloater.h. Definition at line 275 of file llfloater.h. Referenced by getEditModeEnabled(), and setEditModeEnabled(). Definition at line 287 of file llfloater.h. Referenced by closeFocusedFloater(), getFloaterByHandle(), init(), setEditModeEnabled(), and ~LLFloater(). Definition at line 276 of file llfloater.h. Referenced by getFloaterHost(), LLPreviewLSL::LLPreviewLSL(), LLPreview::open(), open(), and setFloaterHost().